Terminal countdown had begun. I removed my earphones and played the live webcast through my laptop speakers, enthusiasm trumping office decorum. SpaceX's prototype F9R rocket stood on the pad in Florida, belching clouds of water vapour as its cryogenic tanks pressurised and prepared for flight. It had been a few months since the last launch. This one had been delayed a few times, and was supposed to test the leg deployment and soft-landing innovations SpaceX is desperately striving to develop. If you can rapidly and completely reuse your rocket, it will cost much, much less. Two minutes to launch. At that moment, E walked in the door. Friends since high school, E now worked figuring out how to attach Boeing 737 wings in Seattle. He instantly comprehended the gravity of the situation and sat down to watch the proceedings. Boom! The rocket sprayed itself with water from the acoustic suppression system and rapidly cleared the tower. Within minutes the first stage had detached and the second stage continued to blast the Dragon spacecraft towards the ISS. 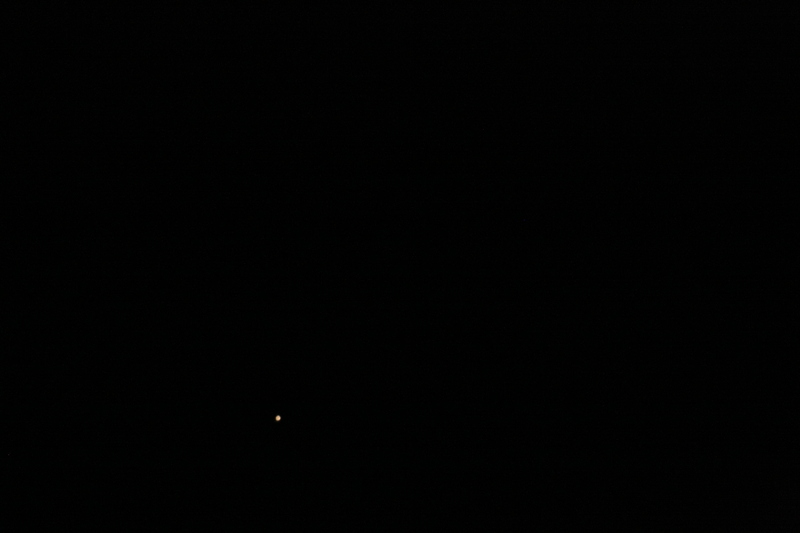 Just before the video feed cut out, we were treated to a view of the Dragon capsule drifting away from the second stage following SECO 1. What an excellent start to an adventure! 20 minutes later, Dr K Radhakrishnan, chief of the Indian space program (ISRO) was in town and giving a lecture just across the road. We got into position and listened to his talk with great interest. If you thought NASA had difficulty answering the question "why rockets when food? ", ISRO has a much more definite statement. Dr R delivered one of the most convincing justifications of space exploration I have ever seen, laying out with great precision the evolution of India's Earth observation satellite programs for communication, disaster management, farming efficiency treatment, and so on, building up to the current development in lunar and Mars exploration, as well as the development of a manned space program in response to China's spacewalk. E and I stumbled from that lecture, jumped in a conveniently located car and zoomed up to JPL, where we met D, E, and E's mother. 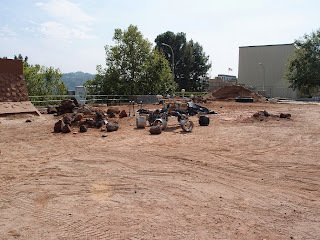 D, a theatre friend who does mission planning at JPL, required our assistance in smuggling an electric piano, and in return gave us the insider's tour of JPL. 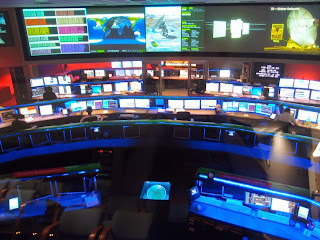 What's JPL, I hear you (singular, hi mum!) cry! 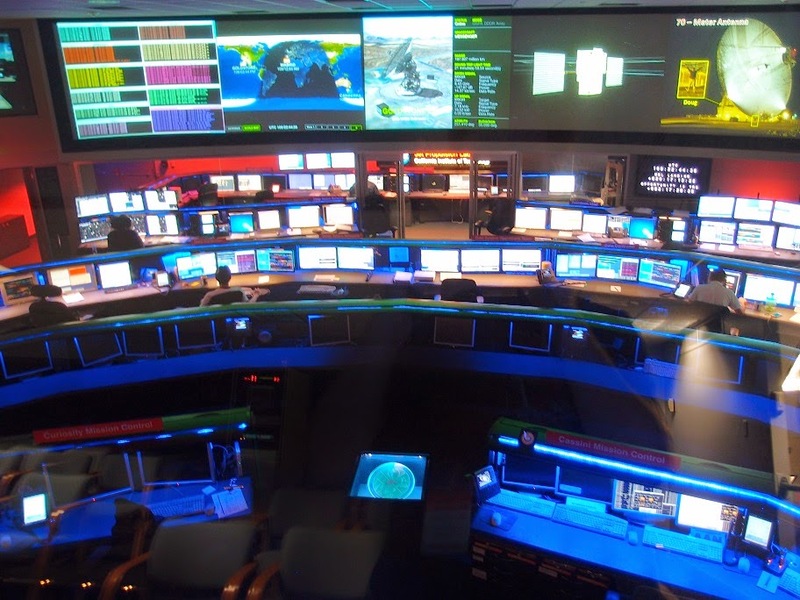 JPL is the Jet Propulsion Laboratory, a Caltech administered NASA center (the largest of about 10) that specialises in space robots, including the Mars rovers. We all piled into D's zippy Nissan Leaf (Zero Emission Vehicle) and drove up to the top of the lab, where we found our way into the 25 foot space simulator chamber. 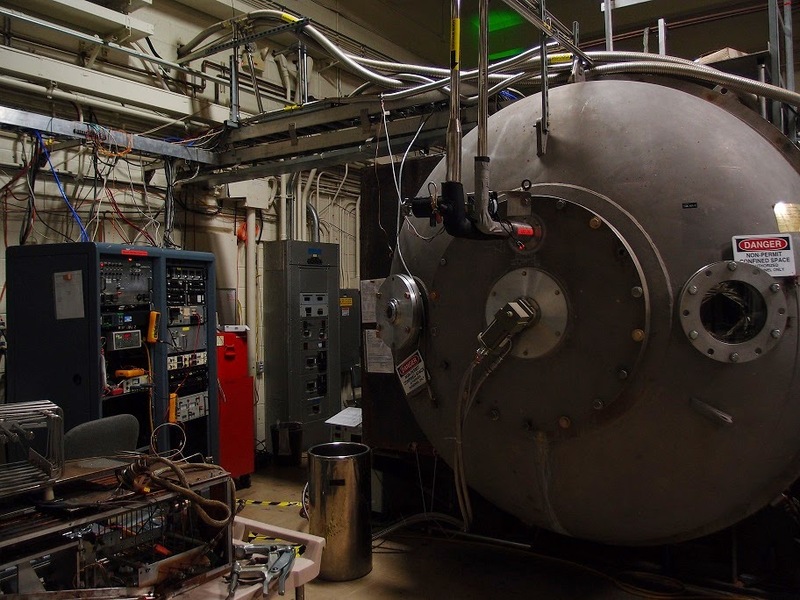 A large vacuum chamber designed to test structures in a simulated vacuum, it was also capable of delivering a megawatt of artificial sunlight to bear on, in this case, a solar panel prototype. It was cool to look around the room at photos of all the missions developed there, replete with shiny gold NASA quality space blanket! Next up was the electric propulsion development lab, which had several glass cases filled with prototypes, including a Hall thruster from the USSR. Electric propulsion is much more efficient than chemical rockets, but basically incapable of delivering substantial thrust, so only useful on very long duration (obviously unmanned) deep space missions. They are still an area of active research and the lab contained what seemed to be a giant submarine, which was, of course, another vacuum chamber. Blinking, we emerged into the sunlight and jetted off down the hill to check out the Mars yard. The Mars yard is a yard where rover drivers can practise driving rovers. Also, they can test how to drive up steep sloped, how to get unstuck, and how to not damage the wheels too much in a controlled, repeatable environment. While there, we had a good look at one of the Curiosity stunt doubles, whose wheels had been rather banged up! They had a regular pattern of holes which print the Morse code for "JPL" onto the surface of Mars, everywhere it goes. Mars is a really long way away - it's pretty incredible to think about this car crawling all over it. We followed that with a visit to Mission control, where giant projection screens showed blips of information still arriving from the Voyager craft, launched in 1974 and now 19 light hours away. Following that, a trip to the high bay, where missions are constructed. Currently in the hot seat was SMAP, a remote soil moisture sensing satellite, complete with a giant rotating deployable dish. Finally, a quick turn around the museum and von Karman hall, with all its highly excellent models of spacecraft, including MRO, Voyager, Cassini, Galileo, and SMAP. We returned from JPL and were, as you can imagine, slightly tired. 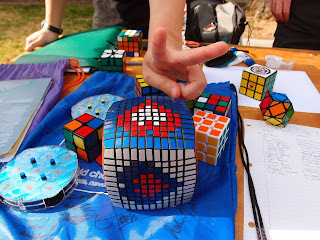 But no rest for the wicked - E managed to procure an ice cream sandwich from the pre-frosh weekend club fair taking place at Caltech. Soon after, P appeared and we drove to Lake St for a dinner at Abricott, a repeatably good French/Vietnamese restaurant. The next morning I could barely move. Age has, it seems, at last caught up with me. Being a spritely 24.999, E left for an Art Deco walking tour in downtown LA, followed by a turn around the Getty. 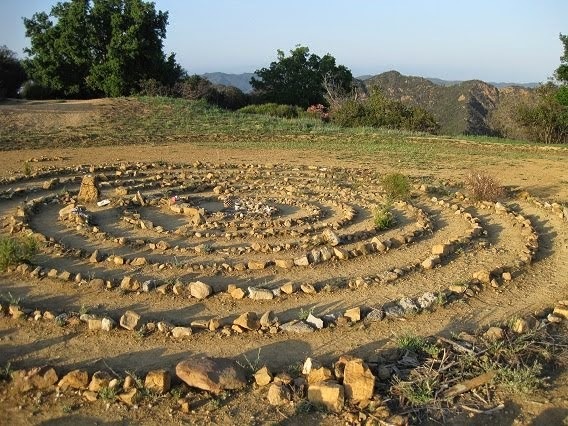 Later that afternoon, P and I picked him up and we drove out through the late afternoon to a nice walking place in the Santa Monica mountains, which includes a labyrinth and an excellent view. On the way back, we opted to go to the Korean Night Market. But 5 blocks away there was already a huge queue of cars and people. Thinking quickly, we headed for the nearest Korean bbq, only to find it too had a long queue of hopefuls. Likewise the second and third Korean bbq. Eventually we found a Korean soon tae cafe, where we sat and pointed at the most interesting thing on a pictorial menu. The two large screens played endless repeats of stock footage concerning the recent ferry tragedy, and in short order our dishes of meat, kimchi, soup, and rice+blood pork sausage appeared. Safe to say we were safe from Jewish vampires that evening. The next morning P and I rose absurdly early to drop her at LAX. With no traffic at 6am I was soon back in Pasadena, where I picked up E and another friend E2, and we headed for an altogether closer airport, El Monte. 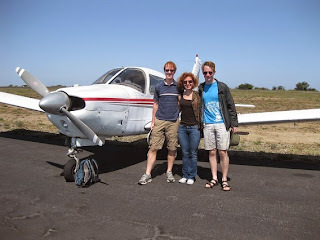 Unfortunately R's Mooney M20 was out for its annual, so we took a neighbouring Piper for a quick spin. 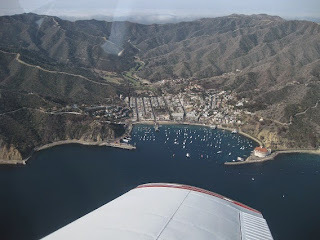 I piloted on the flight out to Catalina island, skimming over coastal clouds before descending through a break to circle around the steep walls of the island, incredibly picturesque in the (by now, according to E) typical Southern Californian sun. 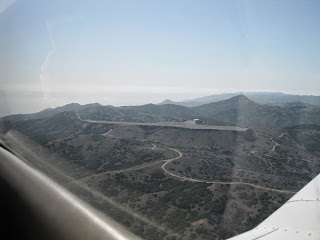 After a few circuits including a school of fish and a whale we zeroed in on the airstrip. Built on the summit of a long ridge, the Catalina "Airport in the Sky" has a disconcerting bend in the middle, which leads to an illusion of falling off the end. Fortunately I had some help and was able to coordinate landing gear, flaps, trim, manifold pressure, propeller pitch, throttle, and a cross wind to put her down on the narrow, pitted strip. We taxied to the parking area and walked to the tower, where we were informed that none other than The Garrett Reisman, Caltech Flying Club and NASA alumnus, astronaut extraordinaire, and current SpaceX director of crewed flight was on the island. Which of the 15 or so planes could be his? I later discovered that I had not managed to guess correctly, but can confirm he has excellent taste in flying machines. Although a quick scramble to a deserted beach was mooted, we very wisely decided instead to eat bison burgers and, being all redheads, squint at the view. Soon enough it was time to return to LA - this time E flew the plane back to EMT, while E2 and I sat in the back seat and lamented the lack of microphones there. E landed with a bump but no screaming protest of twisting metal (always the preferred option) and before long we were back in Pasadena. E, keen to soak up yet more sun to last him the next few months in Seattle headed to a nearby park for a nap, while I prepared feverishly for the next enormously ambitious activity. First, the weather was a-okay and the atmospheric conditions perfect. Next, nap dispatched, E and I drove to a nearby bar and met with the bulk of our co-conspirators, a motley bunch including the Nerd Brigade and many of my friends from various activities around Caltech. With one or two last minute substitutions, it was time to fill the cars and head for the mountains. Indeed, our target that night was none other than the famed Mt Wilson 60" telescope. Built between 1893 and 1908, it was, for 6 short years, the largest telescope in the world. In 1914 it was surpassed by the 100" on the next hill over, and together the telescopes made a series of fabulous discoveries, including galaxies, the expanding universe, and a bunch of other things. 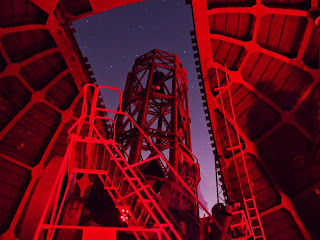 Today, enthusiasts can rent the telescope for an evening for a price that is reasonable, if divided by 25 participants! The cars gradually arrived at the top of the mountain and waited in the lot by the gate. From a nearby road there was a great view of the LA basin, including the distant bulk of Catalina island through the haze. At the appointed time S, our session director, appeared in a jaunty red beetle and led us into the telescope grounds. We parked, enjoyed a quick briefing, deployed our snacks, and watched the dome grind its way open as the sun went down. The first order of the day was Jupiter. The telescope was so huge we had to climb a ladder to reach an eyepiece larger than my (rather powerful) binoculars. Bending over the lens an image swam into view. The planet, appearing the size of a tennis ball with 4 bright Galilean moons surrounding it, had obvious bands. Our distinguished telescope operator M proceeded to drive the telescope like a luxury sports car from object to object. In the course of the next 5 hours, we viewed an incredible array of objects with our own eyes. I didn't take any photos of the objects, but google image search has allowed me to find photos showing the same level of detail, which I copy here. 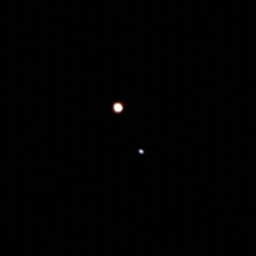 The double star Iota Cancri, one blue, one red. NGC2392, the clown face nebula. 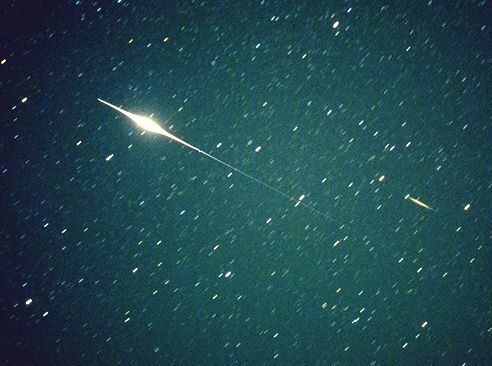 An Iridium satellite flare. The satellite has reflective panels which can flare as bright as a quarter moon, really annoying astronomers. This one we watched from outside the dome. NGC3242, the ghost of Jupiter nebula. 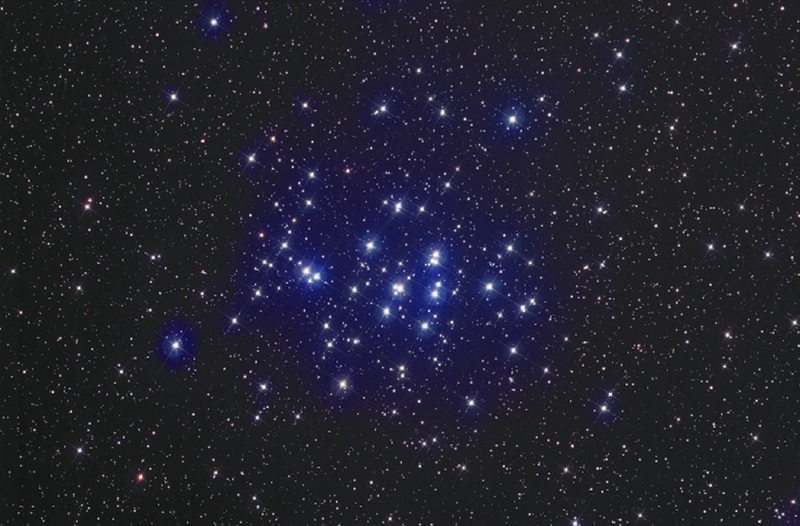 M44, the beehive cluster. An open cluster that was so large most of it fell outside the field of view! M81, Bode's galaxy, a spiral galaxy. The galaxies are rather faint because of low surface brightness and bad light pollution, but still pretty cool. M82, the cigar galaxy, complete with a reasonably recent supernova (pointed to by the line). 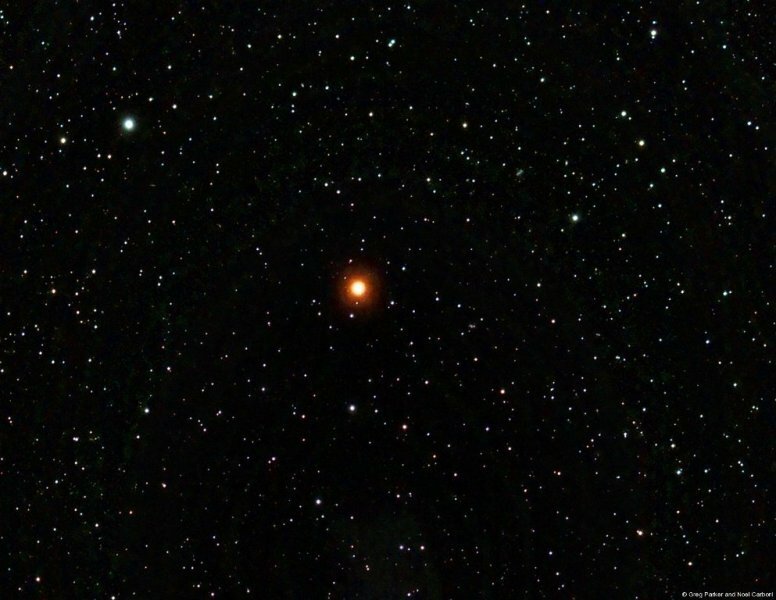 Y CVN, a bright red star otherwise known as La Superba. 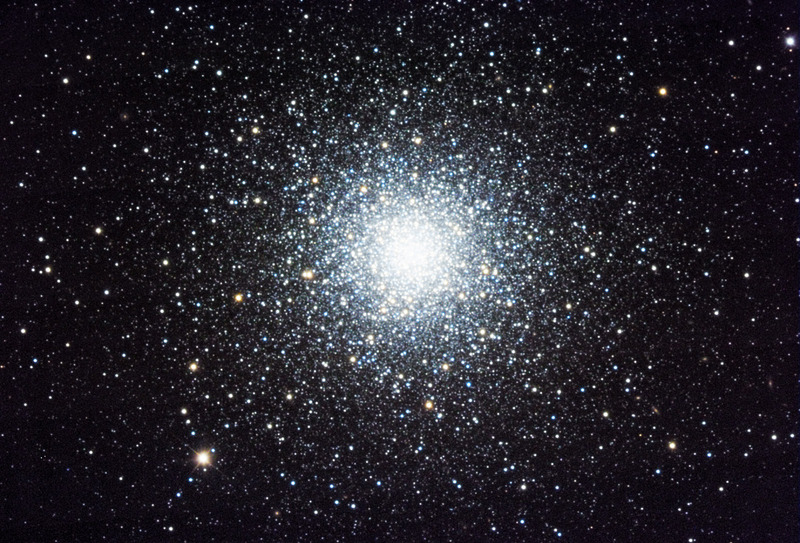 M3, a globular cluster of hundreds of thousands of stars. Lots of wows on this one. Vesta, the largest asteroid, currently in opposition in Virgo. Mars, also in opposition in Virgo. This was the main reason for the trip, as Mars is best viewed this month out of the next two years or so. Through D's telescope a month ago we viewed the northern polar cap, seasonal CO2 frost in the Hellas Basin, and the dark lava flows of Syrtis Major, but this time Mars was facing the other way, so we got a good look at the Vastitas Borealis, including the Acidalia Planitia, Argyre, the various Plani south of Tharsis, and a bit of Syrtis Major again. I found this incredibly exciting. 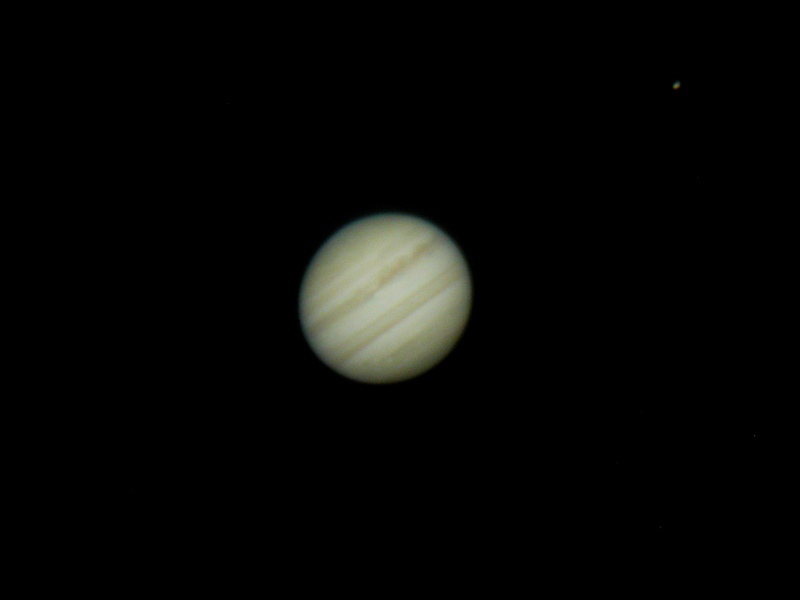 It looked like an actual planet, even though it appears smaller than Jupiter, it is much closer. Finally, Saturn crept over the horizon and came into view. By far the most exciting of the gas giants, Saturn was so low we had to climb the ladder and straddle the telescope to view it. At 22 tonnes, no mere human would make the view shake. Saturn, its rings, gaps in the rings, and at least 9 moons were quite visible. Everyone was so impressed with Saturn we decided to pass on the last object, M13, another spectacular globular cluster. By this stage everyone was practically catatonic with pure nerd joy, marking a great end to a pretty awesome day. They say after you look through this telescope you go home and throw away your existing telescope, no matter how amazing it is. Well, I don't even have a telescope! But the good news is that atmospheric distortion limits the resolution of any telescope larger than about 14". Larger telescopes can see faint things better, but on any given night, you'll see planets just as well through a 14" telescope as anything larger. Of course, if mobile phones and quadrocopter drones are any indication, commercial adaptive optics is the next big thing! Come 1am, I shooed everyone out of the dome and we drove back down the mountain admiring the lights of the sprawling metropolis below. E was to fly out at 6am, so it made no sense to sleep! The night was only middle aged, it was time to party! E packed his things and we headed toward the airport. First, we dropped K in Santa Monica, then we cruised down the 1 toward LAX. Passing under the runway, it occurred to me that SpaceX might not be far away. The launch's recent rescheduling meant my planned factory tour had been cancelled, but we could at least admire the huge factory from outside. We finally found the SpaceX complex. Visible through the fence was the final rocket assembly area, brightly lit and all action. Not bad for 3am on Easter Sunday. I remembered the crucial presence of a supercharger next to the Tesla design studio so we even drove in the driveway to check that out. A few more glimpses of rockets being created and stray parts hanging around, and we returned to the 105 and, dodging buses oddly persistent despite being empty, we said our farewells. I zoomed out onto the near empty freeways and was tucked into bed probably before E even made it to the check in counter. I had only been awake for 24 hours. It is always good to have an excuse to throw an extended and extremely nerdy party, and I'm glad that people like E occasionally visit and always say 'wow' at the right times!